The debate about wildlife preservation has been going on for some time. As resources for attending to the problem shrink and the need for underwriting societal problems rise, there is a tendency to look at some weakened animal populations and say let nature take its course, referring to a fundamental tenet of Darwin’s theory that the most adaptable species become strong or stronger and therefore survive. Species who do not are lost and the mantra of survival of the fittest is chanted everywhere. The idea of “natural selection” presented in The Origin of Species seems to make sense. But during the time that’s elapsed since its publication in 1859, a number of elements have become apparent that make what we’re witnessing in dozens of cases where species are judged to be endangered is a process of “unnatural selection.” Many of the stresses on animal populations are human based: population growth, habitat destruction, hunting and poaching, economic imperatives, water and air pollution, and now, some are suggesting climate change and a warming planet are having dramatic and negative effects on wildlife…..polar bears, for example. In terms of the Giant Panda, evidence for allowing them to become extinct seems, at first glance, to be reasonable: there aren’t many left; they have problems breeding; their habitat and almost singular food source, bamboo, is under constant attack by human incursion or ravaged by natural disasters like the earthquake of 2008; they have digestive problems that lead to poor health and sometimes death; and because they are secretive and live in remote and rugged areas, on the ground research is difficult and the volume of what we really know about the Giant Panda doesn’t have many pages. That, however, seems to be changing as more and more scientific studies are published yielding new and helpful information. If the Giant Panda were ugly, really ugly, I think there would be less commotion about letting the species die out. The “adorable factor,” which pushes many to want the species preserved, while helpful to the general cause, is oft times an impediment to the central arguments for preservation. Those arguments are based on a few concepts that have been proved to be powerful and critically important. One is that diversity promotes stability; The other is that interdependence is the touchstone for ecological health and well being. The removal of any species, large or small, ugly or adorable, has dramatic consequences for those that remain. Look at what the reduction of honeybee populations recently caused. The greatest challenge for preserving wildlife is preserving and enhancing habitats so they become sustainable; so they provide for the triple bottom line: the economy, the environment, and social equity. In terms of Giant Panda, there is a perfect illustration now taking place. The catastrophic earthquake of 2008 caused a horrible human toll. It also destroyed a significant percentage of the pandas’ main food source, bamboo. 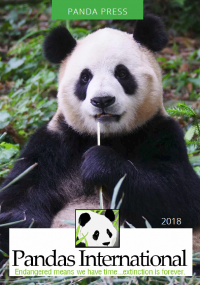 Today, the replanting effort, modeled on using sustainable principles, has local farmers being paid to seed, tend and harvest the new bamboo, slowing their need to keep pushing into and clearing the forest which shelters the bamboo, which allows for less tampering with the natural panda habitat, and allows struggling families to be paid while doing something that helps, not adversely affects, the pandas. Finding new ways to help fund the effort to save endangered species are being investigated and range from eco-tourism, to volunteer programs that are part of travel packages. Pandas International is at the forefront of these new initiatives. Finally, there are arguments for not allowing the extinction of any species based on who we are and what our relationship is with all forms of life with whom we share the planet. Imagine if we worked to construct a conservation motive that was as powerful and ingrained as the profit motive; worked to shape an ethical imperative that says all forms and levels of life must be respected and protected; and, that terms like carrying capacity and sustainability and the web of life and interdependence would be as common in school curricula as the Battle of Hastings and the discovery of penicillin. Then the question of why save the Giant Panda would become how can we save the Giant Panda? “What is man without the beasts? If all the beasts were gone, Men would die from a great loneliness of spirit. For whatever happens to the beasts, soon happens to man. All things are connected.” — Chief Seattle, Suquamish Indian Tribe. Dr. Bill McShea doesn’t love pandas as much as we do. In this talk about the “average bear,” he hilariously explains why, and how our affection is actually a good thing for our world. Dr. Bill McShea is a wildlife ecologist for the Smithsonian’s Conservation Biology Institute at Front Royal, Virginia. He received his education at Bucknell University (B.S. ), University of New Hampshire (M.S. ), and State University of New York at Binghamton (PhD). He has worked at the Front Royal facility since 1986. He is currently co-chair of the IUCN Deer Specialist Group which is responsible for setting endangerment levels for deer species worldwide. He has edited 3 volumes on wildlife management (deer, oak forests and Asian wildlife) and a co-authored a book on deer ecology. When not in Virginia, Bill has worked in Southeast Asia, Gabon, Brazil, and China. He has over 100 publications in scientific journals, many involving wildlife in the Virginia area. Bill’s current research focuses on the management of wildlife populations in forested ecosystems, including giant pandas in China, rare deer in Cambodia, large mammals along the Appalachian Trail, invasive plant/animal interactions, chestnut tree restoration, and wood turtles in Virginia.